Also known as cherry plum, flowering plum is a small to medium-sized ornamental tree native to Asia. Purple-leaved cultivars, such as the popular Thundercloud, are more common in the home landscape than the parent species, which has green leaves. Thundercloud grows to a height of about 20 feet, with a rounded habit, deep purple leaves and delicately fragrant pink blossoms. Flowering plum is usually planted to add grace and color to the landscape, either as single a specimen or in groups. The tree is a favorite in the home garden and is also seen planted along municipal parks or sidewalks. Small, dwarf varieties are suitable for planting in a large container filled with a well-drained potting medium. Flowering plums are low-maintenance trees, but the wilted flowers create litter when they drop from the tree in late spring. 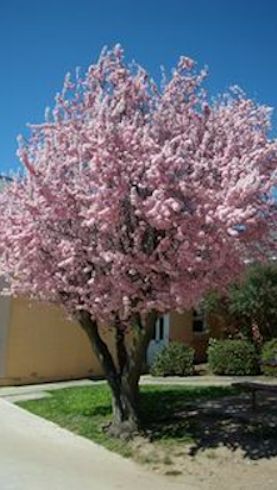 Depending on the species, flowering plum may display foliage from dark green or copper to deep red or purple.